This morning I started to look into the history of a local building – that was my intention! The starting position. But the name of one of the inhabitants seems to have come to the fore, so I veered off on another of my tangents. Fairfax Gascoigne – a good sounding name to start me off on my tangent! Fairfax was born in Leeds on 23rd of November 1850, the son of William Hector Gascoigne and Margaret nee Nicholson. A few months after his birth, the 1851 census was taken and it was at this time that the family were living in Bell Street, Leeds (off Mabgate). 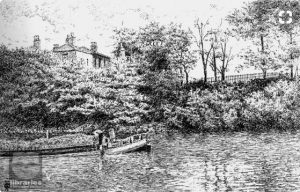 By 1871, William, a painter and engraver had moved his family to Wakefield, and could now be found living in Rodney Yard, Kirkgate. 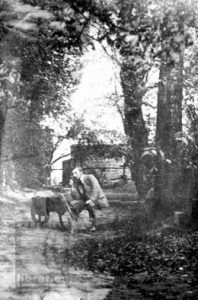 Fairfax was 20 years old and employed as a Saywer’s Clerk, his 16 year old brother, Joseph was a Carriage Trimmer. By looking at the census and seeing Joseph’s place of birth, it can be determined that William brought his family to Wakefield between 1851 and 1855. Fairfax met a lady named Hannah Ward and on the 11th of September 1875, she was to walk down the aisle of St John’s Church, Wakefield on the arm of her father Samuel, a farmer of St John’s, Wakefield. The witnesses to this union were Edward Latham and William Dixon or Dyson. Two years later Hannah gave birth to a son, Samuel Hector Gascoigne. Sadly, less than a year later, in July 1878, Hannah died. Fairfax, now had a young child and a full time job, what was he to do? On the 21st of August 1880 at Holy Trinity Church, George Street, Wakefield, Fairfax Gascoigne married for the second time. His new wife was Ada Purchas a 21 year old spinster living in Kirkgate with her father William Henry Purchas, who was working as a tobacconist. The witnesses were William Henry Purchas and Annie Purchas. The following year the newlyweds were living on Bank Street. Fairfax’s son Samuel Hector was now three years old. Ada was not the only woman in the house, as Margaret, Fairfax’s mother, was now living with the family – aged 68, with no occupation. The years are passing by now but Fairfax and his family are still not living in the house that started these ramblings of mine. Ten years have passed since the last census was taken, the family are at 5 Bank Street, in the South Westgate Ward. Fairfax and Ada now have 5 children between them and Samuel who is now 13 years old, who along with 2 younger half-siblings, is a scholar at St John’s National School. Margaret, Ada’s mother in law is still living with the family along with 42-year-old Mary Fallen who was visiting the family. In 1901 the growing family had moved to 16 York Street. Fairfax was a Solicitor’s Clerk, some of the children were no longer living at home. There were, however, at least two children that had not been in the previous census. The youngest of these children, Archibald Gascoigne, was mentioned in a newspaper, it was that newspaper article that led me to Fairfax. Meat once again has been put on the bones of Fairfax, and he will be mentioned again, but for now, it’s Archibald’s turn. It is through Archibald’s life that the house, the building I earlier today set out to researching. Archibald Gascoigne was born in 1894/5 and baptised at Christ Church, Thornes on the 21st of March 1895. In the census of 1911, the house finally gets a mention! Fairfax, is now 60 years old and been married to Ada, his second wife for 20 years. Fairfax has fathered eight children, of which seven have been with Ada. In the house are 10 people – eight are Gascoigne’s, then there is Mary Ann Burney a 90 year old boarder, followed by Alice Binks, a 51 year old widow, who classes herself as a farmer – she has been married for 23 years and given birth to eight children, seven of whom are surviving for the census to include them. Did Alice know the family well as she was a visitor. Fairfax, in this census, is a Law Clerk, while his other children are employed as ‘Teacher of Domestic Subjects (night classes’, ‘French Polisher (apprentice), ‘Dairy Farm Assistant ‘, and Archibald who is an Office Boy for a local engineering works. Home for the family and visitors is ‘Porto Bello House’ (sic. ), Wakefield. Portobello House was owned by J H Holdsworth, who according to a Tax Valuation, had a connection to Sandal Hall. Portobello House, covering 2 acres, 1 rod and 10 perches, had a Gross Annual Value of £17 10s and a Rateable Value of £14 15s. Mr Holdsworth was the owner of seven further properties listed below Portobello House. A short piece in the Leeds Mercury of 20 October 1915 was the instigator, with its mention of Portobello House and the name of Fairfax Gascoigne – look where this has got me! Archibald enlisted in Wakefield on the 29th of August, soon after the outbreak of war, having left his employment at Messrs. E Green and Sons, where he worked as an Engineers Draughtsman. He joined the King’s Own Yorkshire Light Infantry, the KOYLI, serving as Private 14995 in the 7th Battalion. The 7th Battalion was part of the New Armies, having been formed in Pontefract. By May of 1915, they were on Salisbury Plain before being mobilised and landing at Boulogne-sur-Mere in July 1915, before heading to various engagements in the area around Fleurbaix, some 5km southwest of Armentieres, including further training and familiarising themselves with trenches. Archibald arrived in France on the 16th of July and probably like his fellow soldiers undertook further training along with normal duties. It was while on guard on the night of the 13th of October 1915 that he was killed. 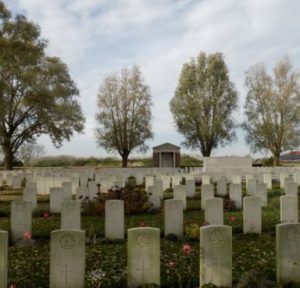 Archibald Gascoigne rests in Rue-du-Bois Cemetery 5km south-west of Armentieres, along with over 800 casualties of which only 455 are identified. The Headstone Report for Archibald’s headstone has his regiment encircled in red ink, along with three others whose ‘headstones are not to be executed until further notice’. While the other headstones put ‘on hold’ have a sentiment at the base, Archibald’s is blank. The other information on his headstone is quite minimal – having no age of death only his regimental information i.e. service number, rank and regiment and finally his date of death. Upon enlistment, Archibald gave details of whom he wished to be his next of kin – he chose his mother, Ada. Archibald’s service would have provided this information, of which there are 21 entries for the service number 14495, sadly, this his has not survived the ravages of WW2. It wherefore, the Register of Soldier’s Effects came up with the information, also giving details of how much money was owed to him from his time in service. Ada was to receive in 1916 £4 17s 1d followed by a further £4 in 1919, she would also have received his three medals, The 1915 Star, The British and Victory Medals – ‘Pip, Squeak and Wilfred’ as they came to be known. Going back to Fairfax Gascoigne, he died on the 28th of April 1923, leaving, according to probate the following month £498 12s 8d to his widow Ada. Ada died in 1935 in Worthing, Sussex. Not only had she lost her youngest son Archibald, she also lost two other boys in the Great War, Peter Herbert Gascoingne in 1917 and Edward Fairfax Gascoigne who accidentally drown while on war service, near Alert Bay, Canada. Looks like there could be a follow-up blog about Archibald’s siblings. Wakefield Libraries have in their collection another photograph labelled ‘Portobello House’, where the house is in the background and a young man is sitting on a cart, could this be Archibald or one of his elder brothers? The house, built in 1825 and demolished in 1956 was situated on the edge of Portobello Estate. This entry was posted in General on November 19, 2017 by carol. I am sorry to say that I have not put fingers to keyboard for a while now, so having come back from a few days in Poland I thought it was time for me to get my act together! Where to start? So many things I have written down ready to research. Who will be next? Who will have lead an interesting life or left a paper trail for me to follow? 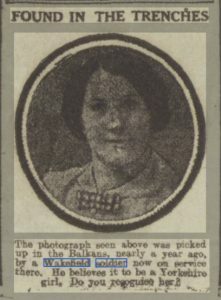 While having another cuppa I mooched around the newspapers uploaded to The British Newspaper Archive site I came across the picture of a lady. The title of the article was short and to the point – well, really you can’t even call the piece an article, it is more of a question. But, with all questions, there is an answer on most occasions. The Leeds Mercury’s heading on Monday the 2nd of October 1916 is simply ‘Found in the Trenches’, followed by this picture. I wonder, now over 100 years later, did anyone contact the Leeds Mercury informing them to the identity of this young lady.